The dogs were jumping, barking and pulling hard on their leads. This caused the sled to jump up and down on the spot, like a kernel of popcorn on a hot plate. I was thankful that the sled was secured to a large tree, otherwise my ride would have been long gone. 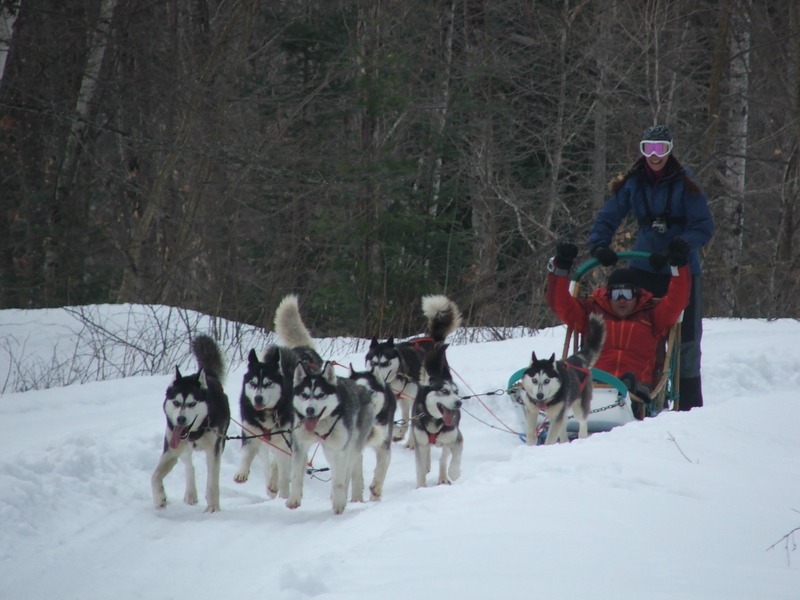 But I shared the dogs excitement as I’d been wanting to try dog sledding for years and now was my chance. I was in Southern Quebec about an hour north of Wakefield at Escapade Eskimo, a small family run operation. This was a late birthday gift to me from my boyfriend K, one of the best I’d ever received. K had selected this place carefully, as we were looking for a hands on operation where we could take part in driving our own sled and dog team. We had come to the right place as this company offers small group, hands on tours so you don’t feel quite like a tourist but rather an assistant. Arriving first thing in the morning, K and I met our guide and facility owner, Sylvain and his wife Caroline at their base of operations. Not wasting any time, we took part in a quick briefing and meet the one other couple who would be joining us on this adventure. With everything loaded up, we all piled into an SUV pulling a kennel full of dogs and three dog sleds behind us. 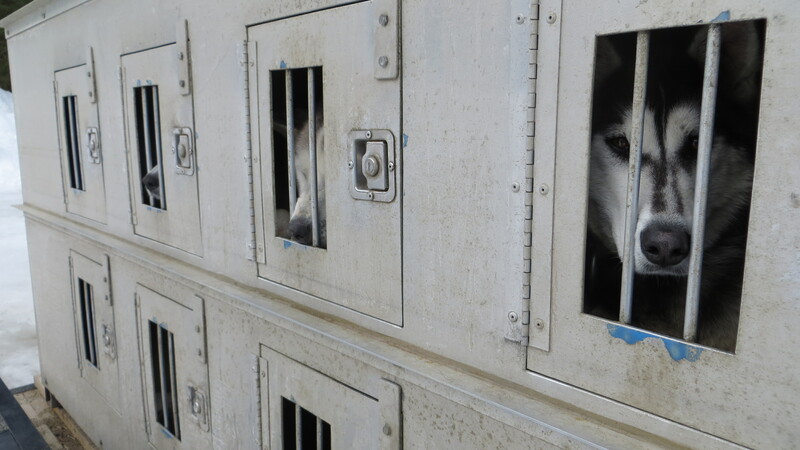 The sled dogs in their kennel. 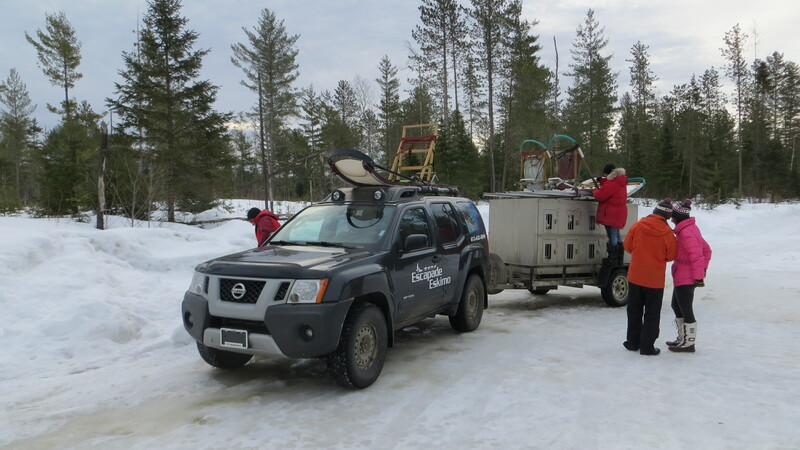 After a short drive down the road to the trail head, we helped Sylvain unload the sleds. We watched as he carefully tethered each sled to an anchor point so the dogs wouldn’t run away with an empty load. Next, Sylvain started unloading the dogs one by one. He instructed us on where to place them in the six to eight dog line up. This was very important as some dogs were leaders, while others were pullers. There was definitely a science to the process! This dog didn’t get along with that dog, and those two were different in size so they shouldn’t run alongside each other. I don’t know how he kept all the dog teams straight but somehow we managed to get them all hitched up and in line. There were two people per sled with Sylvain having his own. One person would drive the dog sled on the way out and then we’d switch for the trip back. Since this was a birthday present to me, K told me to go first while he sat in the sled (he would later come to regret this). Ready to drive my dog sled! When everyone was ready to go Sylvain gave a brief instruction on how to use the quick release that was holding the sled to the anchor point. I nervously went through this in my head, as I had to stand on the back of the sled, hold on with one hand and use the other to activate the quick release. All I could think was I’d better not fall off the sled when the anchor let go and get left behind in the parking lot. I could just see my sled taking off with its passenger but no driver, while I lay in a pile of snow, being literally left behind. Sylvain went first followed by the other couple and then it was my turn. 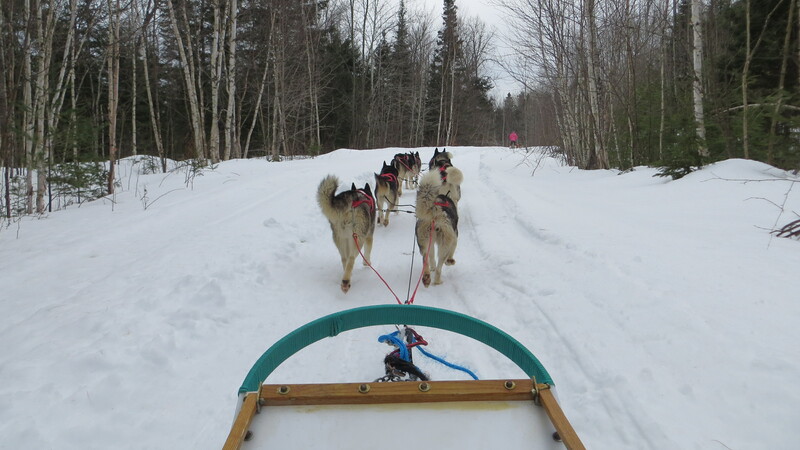 The dogs were getting more and more wound up as each sled took off, leaving my team behind. They were very eager to catch up with the pack, so I braced myself, took a deep breath and hit the quick release. And we were off! Racing down the trail through a beautiful snow covered forest being pulled by a team of huskies, I thought I couldn’t get more Canadian that this! Driving my own dog sled team! 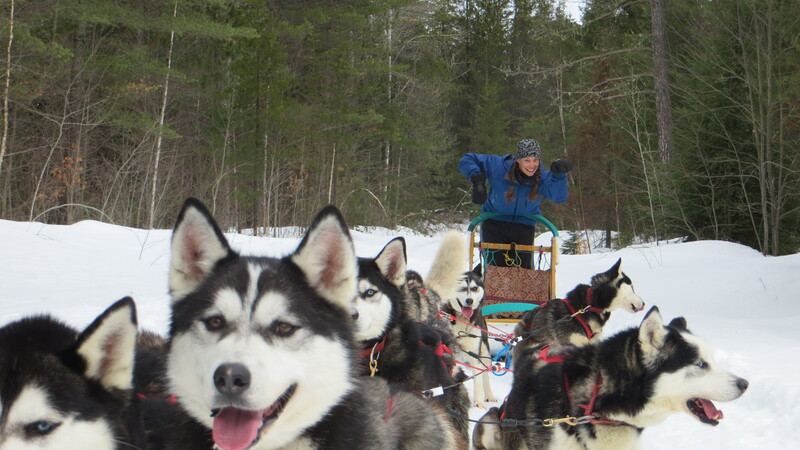 It was such an adventure to be driving my own dog sled team of huskies through the beautiful Boreal forest. Throughout the ride Sylvain stopped frequently to make sure that everyone stayed together and to take photos of us. I was thoroughly enjoying myself as we wound our way through the forest. K on the other hand, got an unpleasant surprise. And then another and another. The dogs, being excited, couldn’t contain themselves and soon K was dodging a mix of snow and dog poop that was being kicked up by the heels of our team! Since he was sitting low in the sled, he was in the direct firing line for both smell and poop. Me on the other hand, I didn’t even notice! 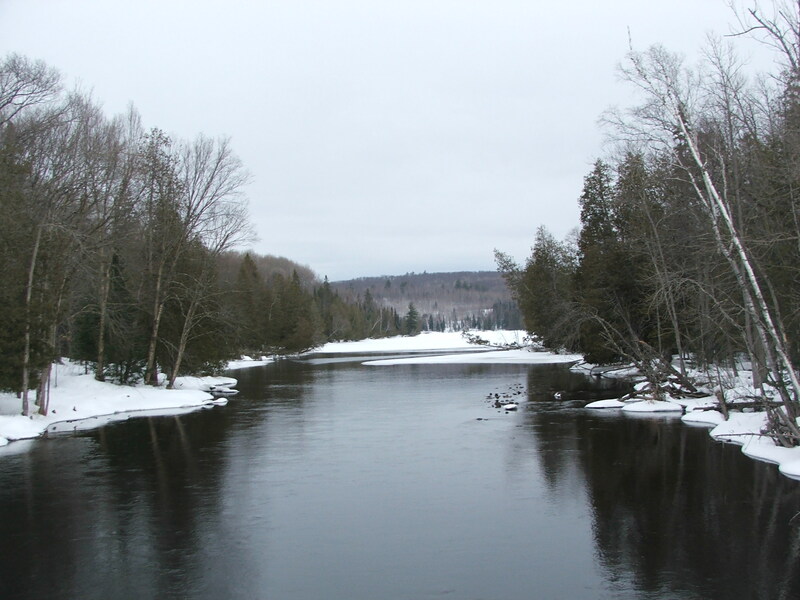 We continued through the beautiful snow covered woods, over a bridge and an ice covered stream. Eventually we arrived at the turnaround point. Here we had a short break to stretch our legs and the dogs got a chance to catch their breath and rest. K and I switched spots with him driving and me riding along as the passenger in the sled. Our ride back was just as thrilling and it was neat to have the chance to view it from the sled. The dogs had fully evacuated their bowels on the way in so I enjoyed a smell and poop free ride back (bonus!). Back at the parking lot we again assisted Sylvain in unhitching the dogs from the sleds and placing them back in their kennels. Once back at the operations headquarters, we were treated with some hot chocolate and a snack while we viewed the amazing photos Sylvain somehow managed to take of us (while driving his own team of dogs no less). The tour lasted only a few hours but gave me a great introduction to the activity. Dogs, outdoors and snow, could it get any better? Perhaps I’ll try a multi-day dog-sled expedition next time! 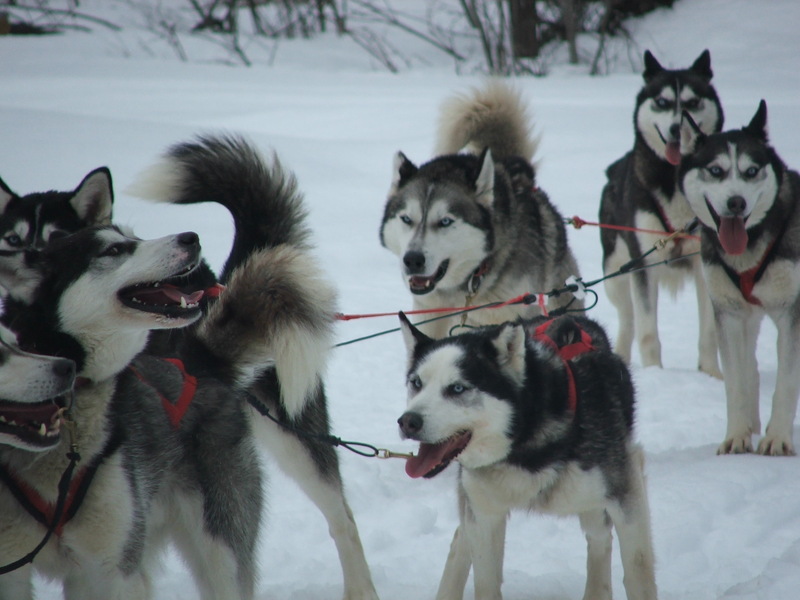 Have you ever tried dog-sledding?